Christmas 2017 was my first time glazing and presenting a Christmas ham. And here it is! I had such fun doing it, and it was totally not as hard as I’d thought it would be. I took some inspiration from some of my favourite chefs; Jamie Oliver, Maggie Beer. Then created my own, DELICIOUS glaze for this beautiful ham. The family LOVED it, and I have to say I was extremely impressed with how the Christmas Ham (and Christmas in July) turned out. But credit must be given to the amazing team at Backfatters Free Range Heritage Breed Pigs who lovingly bred the beautiful animal, then cured and smoked this quality ham (which is completely preservative and nitrate free). If you have any left over dried apricots – try my Apricot Bliss Balls! 8 organic dried apricots soaked in hot water for 10 minutes then drained. about 20 toothpicks, soaked in water for an hour or so. Preheat oven to 250 degrees celsius (or as hot as it will go). Remove the skin from the ham. Make a small incision through the skin near the knuckle of the ham. Then push the fingers of one hand between the skin and the fat and use the other hand to peel back the skin. Carefully work your way from the top of the ham down to the knuckle. Keep the skin to drape over the ham if you don’t eat it all and need to store it in the fridge. Score the fat of the ham with a sharp knife to make a diamond pattern. Place the ham onto a meat roasting tray (tray with elevated rack in it). Pour 1-2 cups of water onto the tray (this will prevent the juices from burning). For the glaze, place the 8 soaked apricots, mustard, honey, molasses and water into a blender or food processor and blend until smooth. Smother the ham with this glaze. Place into the preheated oven for 8–10 minutes so that it gets a good ‘burnish’ look. 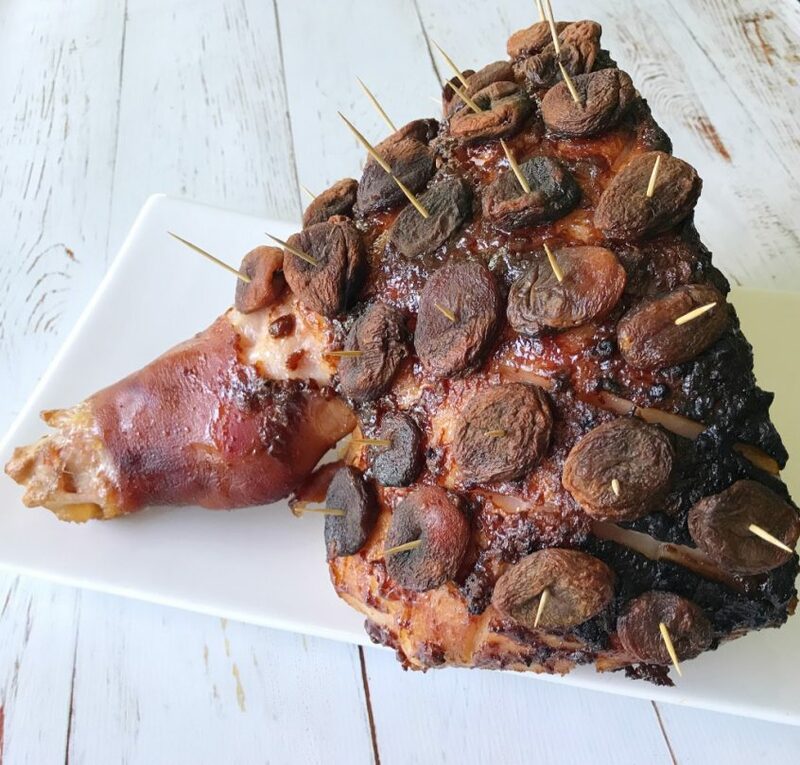 Remove from oven and use the toothpicks to place a single apricot in each diamond of the ham. Place back in oven for a further 8-10 minutes. Remove from oven and place on the table ready to carve. For the apricot-mustard sauce, heat medium sized pan to medium heat, add a little butter or olive oil, the onions and garlic and sautée for 1 minute. Add the apricots and sautée for another minute. Add the honey, molasses, mustard, broth and any left-over glaze to the pan and stir to combine well. Reduce heat to a simmer and allow to reduce to a sauce-like consistency (about 10 minutes). Serve with the ham at the table.